Since the days when Darjeeling Tea from West Bengal, became the first GI tagged product in 2004-05, 195 more products have found their way into the list. The last product listed in the list, being Patan Patola from Gujarat. While Karnataka is occupying the top slot with 32 products to its credit, Tamil Nadu has 24 products in the GI Registry. While Kerala has 20 items with GI tag, Andhra Pradesh has 22 products in the Registry. 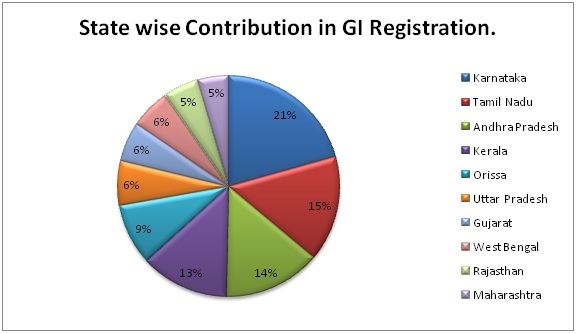 The table 14.1 below shows the state wise distribution of GI Registrations. The latest to get the GI tag from Karnataka are Bangalore Blue Grapes, Kinhal Toys, Udupi Mattu Gulla Brinjal & several others. GI Registered products from Karnataka state (2004 – till date). January 15, 2014 in Jan 2014, Newsletter.